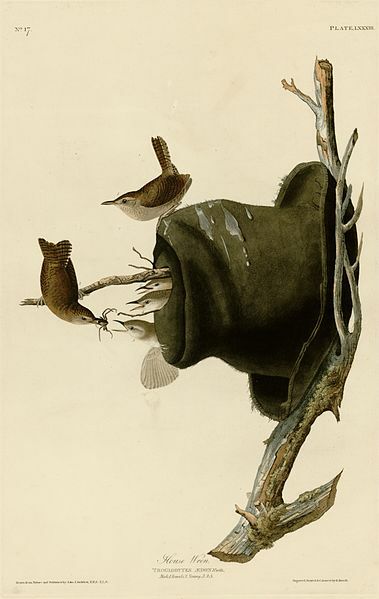 Early naturalist and artist John James Audubon famously painted a family of house wrens utilizing an old hat as a nesting location. Birds don’t waste much time getting down to the business of nesting each spring. I’ve observed baby robins and bluebirds that are already out of the nest. At home, I have nest boxes occupied by Carolina chickadees, Eastern bluebirds and tree swallows. Unfortunately, for a variety of reasons, nesting attempts don’t always end successfully. Kathy Shearer, who lives in Emory, Virginia, wrote me last month about a problem affecting her nesting bluebirds. “I had an active bluebird nest with five eggs until yesterday, when I discovered the shell remnants on the ground beneath the pole,” she wrote. “One was clearly drilled through.” Kathy sent along a photo showing the damage. Photo by U.S. Fish & Wildlife Service/Dave Menke House wrens make dutiful parents, often tending a brood of as many as eight young. Kathy’s question presents a definite quandary. With invasive birds, like house sparrows and Eurasian starlings, many bird experts recommend tearing out their nests. Some even suggest disposing of eggs and young. It sounds cruel, but native birds like Eastern bluebirds are at a disadvantage when it comes to competition with these non-native invaders. House sparrows and starlings were never meant to be part of the fauna of North America. Human actions introduced these birds into an environment unprepared for the consequences of the intrusion. That’s what makes the problem with house wrens a difficult one to solve. The house wren is a native bird that is as much a legitimate part of the environment as bluebirds, tree swallows or other cavity-nesting birds. Anyone who has ever observed tree swallows and bluebirds competing for a nest box knows that these birds are fierce in their struggles for a nesting location. The house wren, however, uses another approach. These small wrens are stealthy and somewhat ruthless, although both of these terms are something humans have applied as labels to this bird’s natural behavior. 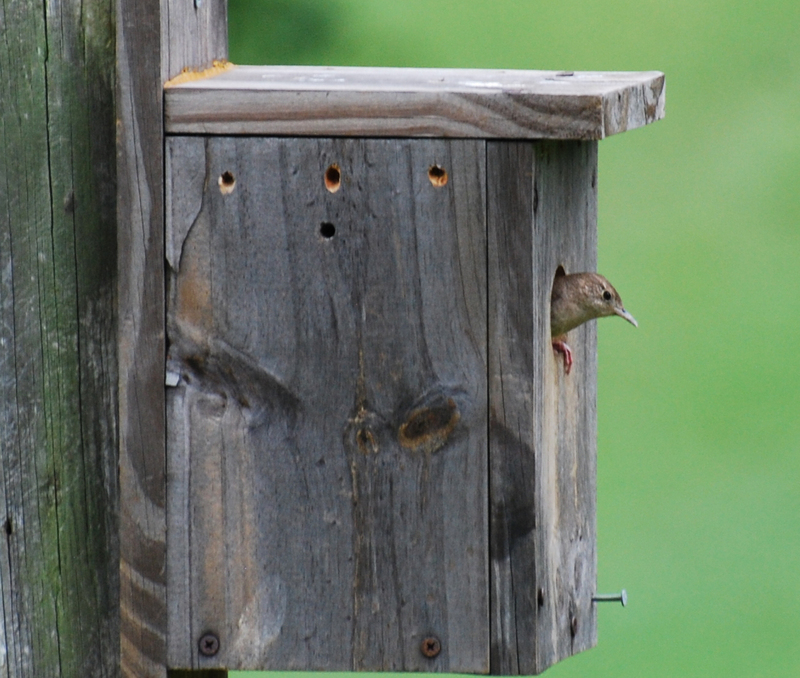 Photo by Jean Potter A house wren checks out a nesting box. Males will often build “dummy nests” to provide females with a choice of nesting locations. Known by the scientific name of Troglodytes aedon. In Greek myth, Aedon is a woman changed by Zeus into a nightingale, a bird famed for its song. A troglodyte is a cave-dwelling individual. So, roughly translated. the house wren’s scientific name is “cave-dwelling nightingale,” which emphasizes the penchant of the house wren for producing a bubbly, persistent song all out of proportion to the bird’s tiny size. The “cave-dwelling” description comes from the habit of house wrens, as well as other members of the wren family, to skulk near the ground for exploration of nooks, crannies and crevices in search of food. The house wren arrives in the region just in time for the start of the spring nesting season. Although it is a native bird, this wren often fails to win favor because of its habit of damaging the nests of other cavity-nesting birds such as Eastern bluebirds and Carolina chickadees. 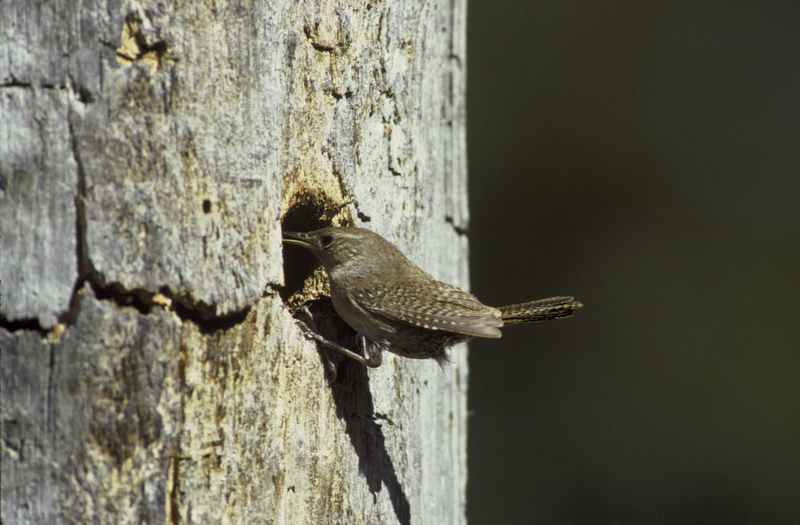 “To a house wren, almost any other nesting bird in its territory threatens competition,” wrote John Eastman in his book, “Birds of Forest, Yard and Thicket.” Eastman, a wildlife biologist and naturalist, emphasized in his chapter on the house wren the territorial nature of the bird. Not only will house wrens puncture the eggs of other birds, they will also kill young birds that are still confined to the nest. Once a pair of house wrens adopts a nesting site, they may remain loyal to it for many years. According to Eastman, these tiny birds display a powerful fidelity to nesting locations from previous seasons. Photo by Bryan Stevens The two-toned Carolina wren is, for the most part, a kinder and gentler neighbor to other birds in comparison to the related house wren. I did offer some advice to Kathy, although I cautioned that wrens can be tough to deter since they are extremely territorial. However, they don’t like open spaces as much as bluebirds. I suggested that she make sure her nest boxes are not located near buildings or trees, which could encourage house wrens. House wrens feel most confident when there are thickets, hedges or other thick cover available. Kathy responded with another email after I offered my suggestions. She noted that she lives in a wooded area, so finding open space is difficult. “This bird box is in the middle of the garden, the only open space we have, and has been successful for many years,” she wrote. Kathy plans to move the box and to put up a second one in the woods that might satisfy the wrens. She also did some of her own research and came across the suggestion of building a guard over the entrance that blocks it from view. “Might give that a try,” she wrote. 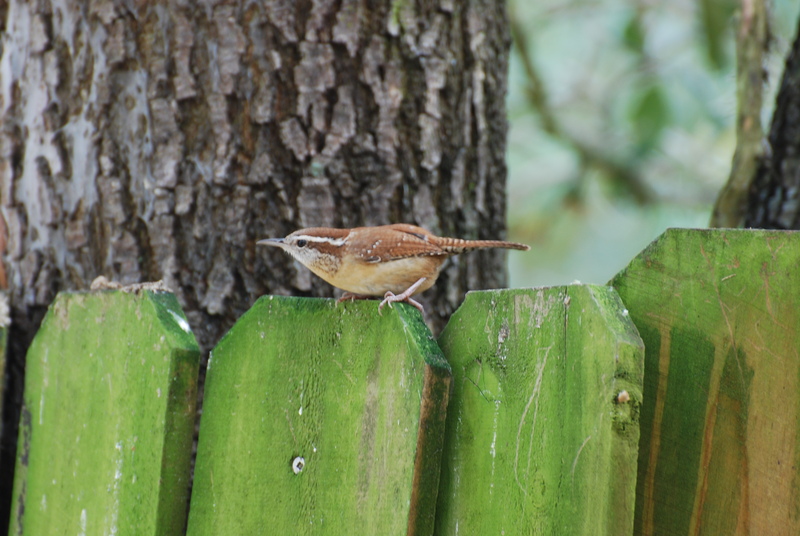 Photo Courtesy of Jean Potter A Carolina wren creeps along a fence. Other wrens in North America include Bewick’s wren, marsh wren, sedge wren, cactus wren, winter wren and rock wren. As much as I hate it when these conflicts arise, house wrens are a native species of bird. That sets them apart from birds like house sparrows and starlings, which are not native. These wrens are small birds, so their aggressive nature is probably a survival adaptation that has served them well as they must contend with larger birds for limited resources. House wrens are not as photogenic as bluebirds, but they have a lot of traits that make them worth observing. 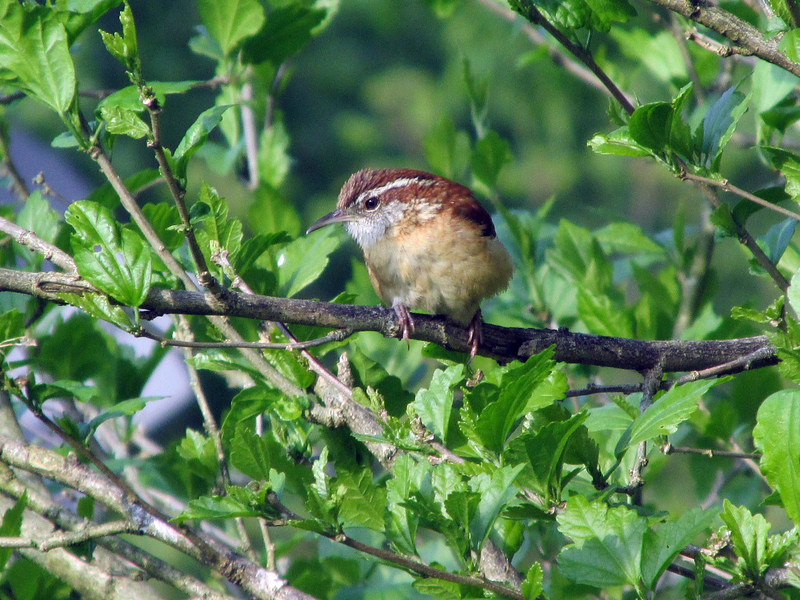 First and foremost, this wren produces an enthusiastic and energetic song. The parents will also rid yards and gardens of a great many insect pests as they work to keep six to eight hungry babies fed. Every wild creature has its place, so I try to offer equal respect to them all. This entry was posted in Birding, Birds, bluebirds, House wrens, Wrens and tagged Birding, birds, bluebird nesting problems, bluebirds, Bristol Herald Courier, Bryan Stevens, Carter County Compass, Elizabethton Star, Erwin Record, Feathered Friends, House wrens, McDowell News, Our Fine Feathered Friends, The Erwin Record, Wrens on May 29, 2016 by Bryan Stevens.